Ambrogio Lorenzetti (1285–1348), The Presentation in the Temple (1342), colour on panel, 257x 168 cm, Galleria degli Uffizi, Florence. Wikimedia Commons. Aside from ‘pure’ art, painting has had many different and sometimes conflicting roles. Until the twentieth century, one of those has commonly been to represent a scene in some reasonably optically accurate form. That requires a systematic method for projecting a 3D scene down to a flat 2D image in a way which preserves the observed appearance of, and spatial and metric relationships between, different objects within the scene. Extensive psychological research has now been undertaken which demonstrates that human visual perception does not quite operate using linear perspective projection, but it comes conveniently close for that to be the most practical solution for painting. The Greeks and Romans developed quite sophisticated representational forms of painting, and although they (almost certainly) did not discover linear perspective projection, some Roman paintings came impressively close. 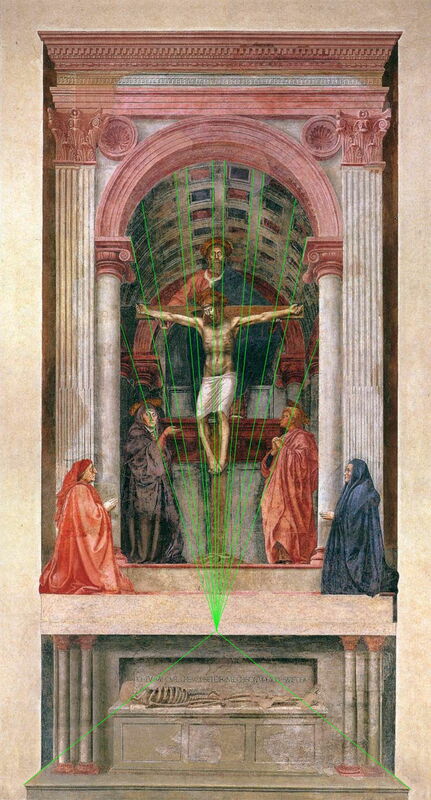 In the late Middle Ages, the period prior to the Renaissance, artists such as Giotto drew tantalisingly close to these projections, but it was not until the early 1400s that the formal system of linear perspective, and its projection from 3D to 2D, became known and used. 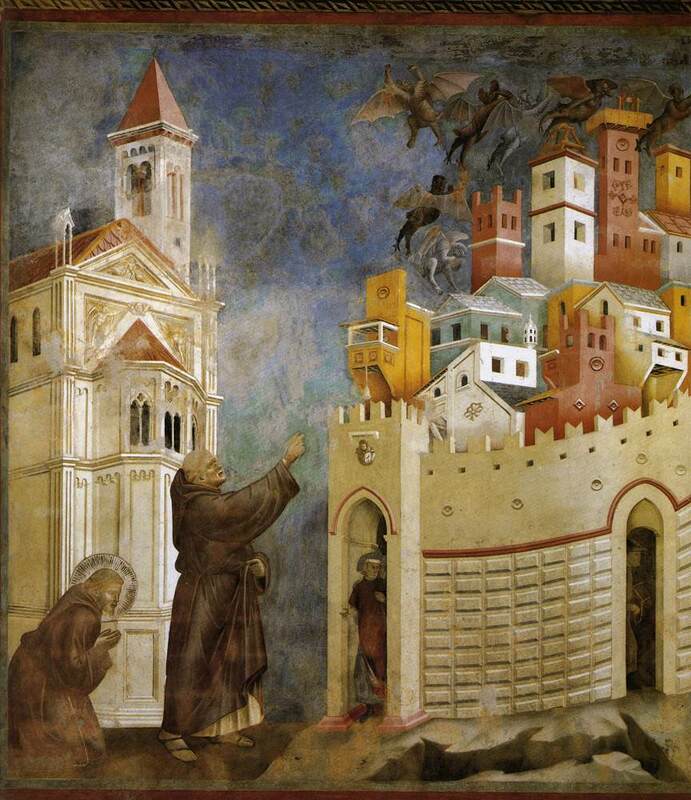 Giotto di Bondone (1266/7-1337), Exorcism of the Demons at Arezzo (1299), fresco, 270 x 230 cm, San Francesco, Upper Church, Assisi, Italy. WikiArt. 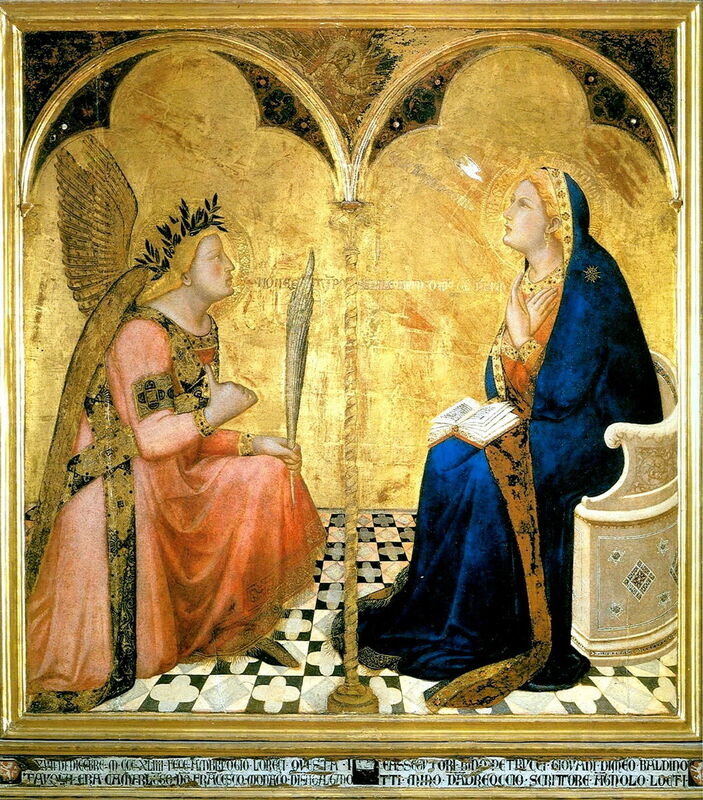 It has been claimed that the first painting made using an accurate linear perspective projection is Ambrogio Lorenzetti’s (c 1290-1348) Annunciation (1344), which is also his last known work. This is on the basis that it includes a floor which does appear to have been correctly projected. Unfortunately the floor is the only such object to have been included in the projection, and other objects such as the chair on which the Virgin Mary sits do not appear to conform to the same vanishing point. 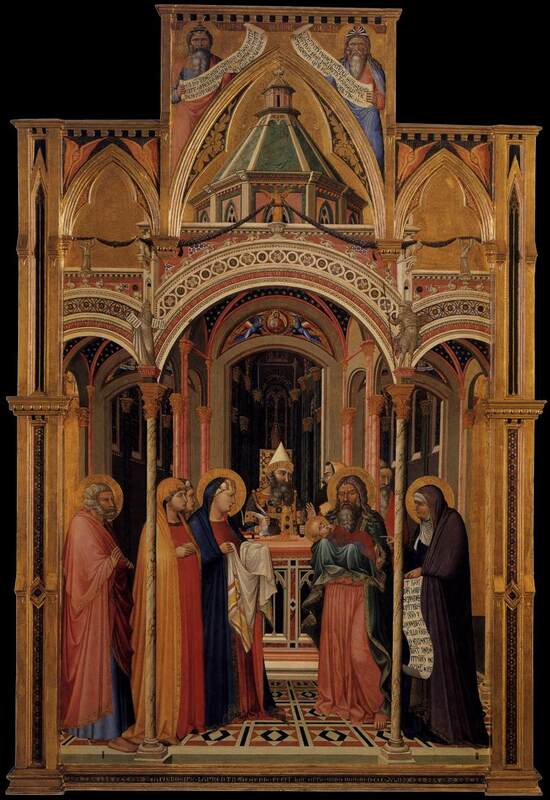 Lorenzetti’s earlier The Presentation in the Temple (1342) also uses a geometric pattern in the floor which appears to have been projected in accordance with principles which were not known until Brunelleschi discovered them. However, as is common in paintings made by the Romans earlier and prior to about 1420, it has multiple vanishing points. Ambrogio Lorenzetti (1285–1348), The Presentation in the Temple (1342), colour on panel, 257x 168 cm, Galleria degli Uffizi, Florence. Wikimedia Commons. Lines of projection marked in light green. The discovery of linear perspective projection is attributed to the Florentine architect Filippo Brunelleschi (1377-1446) in about 1420, although it may have been as early as 1414. Antonio Manetti, his biographer, wrote an account in which Brunelleschi constructed two paintings of churches in Florence according to geometrical optical principles, and made an arrangement using a small hole and a mirror so that a viewer could compare the 2D painted view with the observed view at the correct locations. Those who tried this out were apparently amazed at the similarities between the 2D and observed views. Brunelleschi had started a revolution which took many decades to change painting, but which coincided with the Renaissance aim of making paintings look more real. Some time after 1428 another architect and polymath, Leon Battista Alberti (1404-1472), met Brunelleschi, and learned from him how to construct basic perspective projections. He included details in his major manual on technique Della pittura (On Painting), which he completed in 1435. 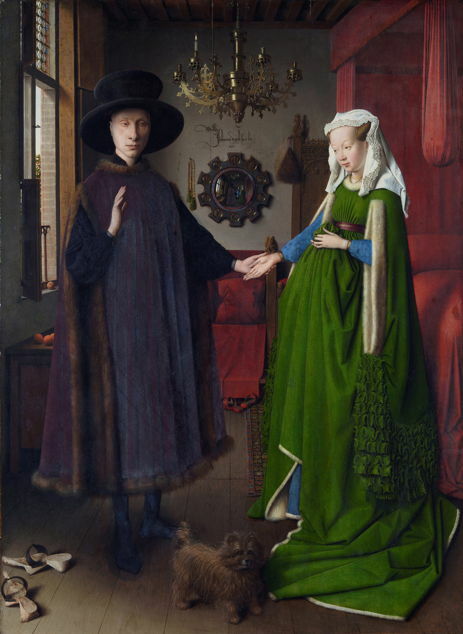 In the Northern Renaissance, leading artists including the van Eycks did not use linear perspective projection, but had independently come quite close to it in their explorations of optical effects and surface textures. Although Alberti’s account enabled many painters to learn and practise perspective projection, it was not until the end of the 1400s (probably 1482-92, perhaps earlier) that the first proper account was written, by Piero della Francesca (c 1415-1492). He was not just one of the great Master painters of the Renaissance, but was also renowned as a mathematician and geometer. From about 1500 on, European painters relied on his De Prospectiva Pingendi (On Perspective for Painting) and successor manuals, and linear perspective became an expected feature of 2D visual art for the next 400 years, at least. Outside Europe, in China, Japan and Korea, and in the Indian sub-continent, linear perspective has not had the same hold as in Europe, even in paintings which have been quite realist. Raja Ravi Varma (1848–1906), Urvashi and Pururavas (ഉർവ്വശിയും പുരൂരവസ്സും) (date not known), media not known, dimensions not known, location not known. Wikimedia Commons. 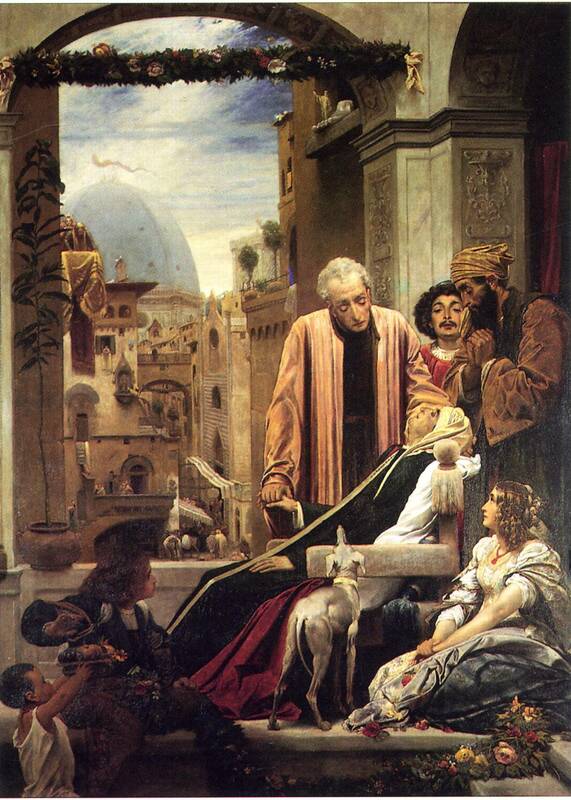 Its importance in Western painting is also hotly debated. For some, it is a cornerstone and one of the major achievements of the Renaissance; others rate it no more than a rhetorical or stylistic convention. There is no doubt that it has been a very visible change, though. The purpose in revisiting the early history of perspective in Europe is that the earliest surviving major work of art which implemented Brunelleschi’s discovery was painted on the wall of the Basilica of Santa Maria Novella, in Florence, in 1426-8 – within a decade of Brunelleschi’s demonstration, seven years before Alberti completed his book, and about 50 years before Piero della Francesca provided the first proper instruction manual. The painting in question is Masaccio’s Holy Trinity, which he completed when he was only 26. Within a few months, Masaccio was dead. This weekend his life and work will be the subject of a couple of articles in my Brief Candles series here. Masaccio (1401–1428), The Holy Trinity (1426-8), fresco, 640 x 317 cm, Basilica of Santa Maria Novella, Florence. Wikimedia Commons. Lines of projection marked in light green. Andersen K (2007) The Geometry of an Art. The History of the Mathematical Theory of Perspective from Alberti to Monge, Springer. ISBN 978 0 387 25961 1. Brener ME (2004) Vanishing Points. Three Dimensional Perspective in Art and History, MacFarland. ISBN 978 0 7864 1854 1. Dunning WF (1991) Changing Images of Pictorial Space. A History of Spatial Illusion in Western Painting, Syracuse UP. ISBN 978 0 8156 2508 7. Gombrich EH (1976) The Heritage of Apelles. Studies in the Art of the Renaissance, Phaidon Press, Oxford. ISBN 0 7148 1708 2. Panofsky E, tr Wood CS (1997) Perspective as Symbolic Form, Zone Books. ISBN 978 0 9422 9953 3. Sinisgalli R (2011) Leon Battista Alberti On Painting, A New Translation and Critical Edition, Cambridge UP. ISBN 978 1 107 00062 9. Posted in General, Painting, Technology and tagged Alberti, Brunelleschi, linear perspective, Lorenzetti, Masaccio, perspective, Piero della Francesca, projections, renaissance. Bookmark the permalink.